These pictures, taken by Paul Stinsa of Chicago on July 8, were so astounding that some viewers claimed the images must have been computer-generated. But "the photos are not doctored in any way," Stinsa says. When a lone, female wolf appeared at the falls at Brooks River in Katmai National Park this summer and began catching red salmon as if she were the most efficient of brown bears, photographer Paul Stinsa from Chicago didn't know what to think. So, he did what photographers do. He took pictures, and he kept taking pictures. Wolves have long been known to feed on salmon, but the way this wolf slipped into a fishing area owned by bears and the skill with which she went after the salmon caught some people by surprise. "If I had a net and dynamite, I couldn't have caught fish so efficiently," said Stinsa, a Midwest-based manager for United Airlines. "She wasn't in the river two minutes, and she grabbed a fish and was out of there. She did this 15 times in a row." Katmai superintendent Ralph Moore said that when Stinsa's photographs first popped up on the Internet, they stopped him cold. "What a neat thing," he said. "I wish I would have seen that, too." A wolf vying for salmon along with the oft-photographed Brooks bears was surprising enough that more than a few photographers thought the pictures might be computer-enhanced composites. Reached by phone in Illinois last week, Stinsa had heard such comments, too. "The photos are not doctored in any way," he said. They were cropped, he said, and some spots with bad light were highlighted to make them look better. Other than that, they are 100 percent as they appeared in the viewfinder of his camera, he said. And he has Park Service employee Niki Quester as a witness. "She said she'd never seen anything like this,'' Stinsa added. 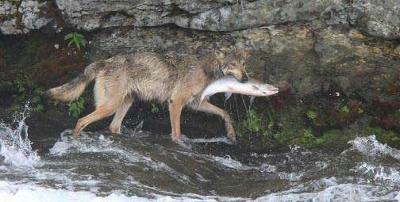 Wolves have been reported fishing at Brooks Falls before, but not quite as efficiently as this one. David Person, an Alaska Department of Fish and Game biologist who studies wolves in Southeast Alaska, said it is not unusual for wolves to catch salmon, but it is odd for them to use an area thick with bears. "It would certainly seem to me highly unusual,'' he said. Wolves and bears tend to be antagonistic toward each other. Wolves have been documented killing bear cubs, so the bears have reason to dislike wolves. Still, Person added, he has seen well-fed wolves ignoring well-fed black bears and vice versa on Southeast salmon streams. If there is enough food available for everyone to get stuffed, he said, "they might not really notice each other." 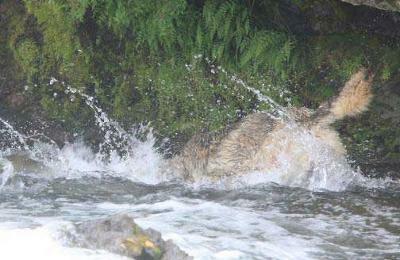 Conditions at Brooks Falls this summer might also have played a role in what happened. Water levels in early July were unusually low, prompting many bears to move down into the river below the falls to feed. So many bears had gathered there that Stinsa said it was hard getting to the viewing platform at the falls. The bridge across the lower river was closed due to the bears constantly crawling over it. "I guess I got lucky that day," the photographer said. He got across just before the bears took over the bridge. When he arrived at the falls, Stinsa said, Quester was there along with a handful of Japanese tourists. They were on the platform usually crowded with photographers rotating in and out. Because there was so little traffic on this day (July 8), however, Stinsa got extended time on the platform. "The bridge was closed all afternoon," he said. "No one else seemed to get across." 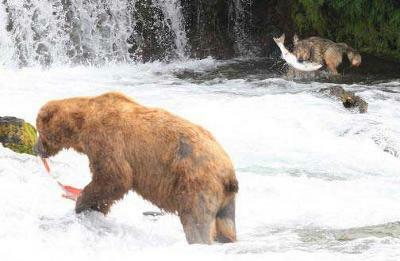 For most of the day, he photographed a couple of grizzlies at the falls catching fish. There was a large, male bear and a subadult, he said. In the afternoon, the wolf appeared. "The wolf kind of came out from under the platform," he said, looked around and disappeared for about half an hour. It reappeared on the far bank. Stisna said the wolf seemed to be eyeing a pile of partially eaten salmon carcasses that had accumulated below the falls where the bears were fishing. Everyone on the platform thought the wolf was going to make a try for some of those fish, Stinsa said. 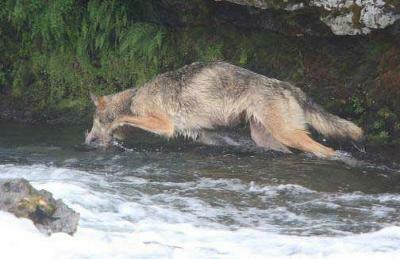 But when the male bear chased the subadult out of the falls and opened up some space, the wolf started fishing instead. "She came down the (game) trail along the rock wall," Stinsa said. Clearly, he said, she was watching the water and stalking salmon in the shallows. When she saw what she wanted, she lunged, grabbed a fish by the tail, pulled it out, bit into its back to get a better hold and took off. She was gone for a matter of minutes and then returned to catch another fish. That was the pattern for slightly over an hour. Often, Stinsa said, bears could be seen moving in the woods behind the wolf as she went to and from the river. But she continued to fish. He suspects she was either delivering the fish she caught to cubs or handing them off to another wolf to carry back to a den. "I can't imagine what else she was doing," he said. The wolf was seen fishing at Brooks Falls for several weeks during the summer and appeared to be nursing, said Katmai ranger Peter Hamel. Person said it is possible the wolf was just high-grading her kills -- eating the fat-rich brains and eggs the way bears do when salmon are plentiful -- and then returning for seconds. 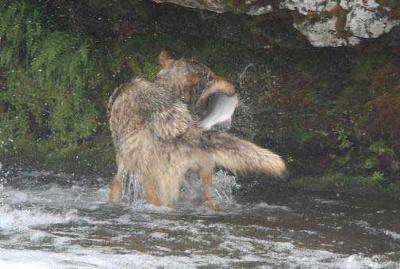 But he doesn't discount the possibility she was delivering fish to pups or even to another wolf helping to feed pups. Pup survival in Southeast, he said, has been found to be unusually high because of this very sort of behavior. A bounty of salmon -- some studies have concluded up to a quarter of wolves' diet on Prince of Wales Island comes from marine sources, most likely salmon -- can be key to helping young wolves survive that difficult first year. As for catching salmon, Person said, he's found wolves to be deadly predators of fish when they can find them in shallow pools where they can be stalked, chased and grabbed. "I've watched them," the biologist said. "I have no doubts about how efficient they are. They're actually very good at fishing." Outdoors editor Craig Medred can be reached at cmedred@adn.com or 257-4588.